IDC's third quarter figures are in, complete with a few unexpected shake-ups. The entire cellphone market grew 2.4% over the same time last year, but smartphones shipments drove the majority of that, showing growth of 45.3% and beating the analysts' expectations. 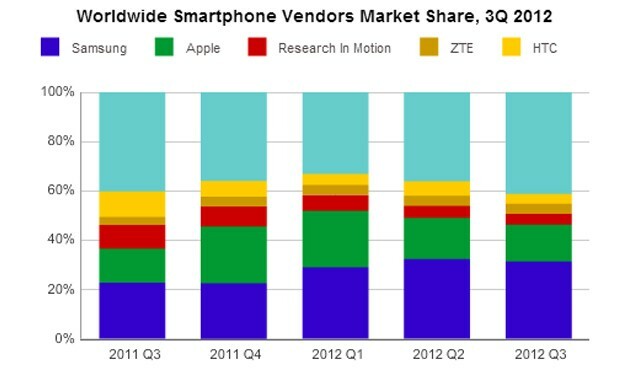 Of the 179.7 million smartphones shipped, Samsung and Apple devices accounted for almost half of them, with the companies retaining their number one and two positions in the market, respectively. IDC notes that iPhone shipments didn't increase, but this is somewhat expected given the latest iteration was released a short time before the end of the quarter.